One of Dr. Dale’s, The Wild Doc’s, favorite “anti-flu”, immune enhancing herbs! Along with elderberry, reishi, and all the other leaves God has created for healing! 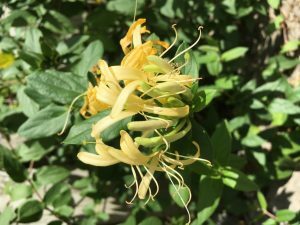 God designed honeysuckle in such a way that it enhances our immunity, along with effectively blocking the flu virus, from infecting our lungs and liver, the 2 organs that are often attacked most, by the flu virus. The science has proven that there is extreme intelligence behind the design and beneficial effect of honeysuckle when it comes to enhancing and assisting our bodies in fighting off the flu! In one of my favorite scientific studies about honeysuckle, Honeysuckle-encoded atypical microRNA2911 directly targets influenza A viruses, I can’t help but be amazed by how this plant was designed! While this is an animal study, it shines a light on how honeysuckle has been enhancing the immune system of those consuming it for health-enhancing purposes, like boosting the immune system to fight the flu. What this means is that after boiling honeysuckle, making a decoction or tea, microRNA from the plant survives the boiling process, and by drinking it, the concentration increases in the body. If you take the time to read the articles and medical journals, you will plainly see that Roche is hiding the truth of harms and attempting to claim the effectiveness of a drug that has only been shown to kill people and cause people to kill themselves. Read this Journal article and see for yourself. Beyond the note of the lies by the CDC director regarding Tamiflu, you will find the “hard pill for some to swallow” that the CDC is protecting the profits of Big Pharmakeia and not the public. Which is what most physicians and patients are deceived to believe. “The high mutability of pathogenic IAVs enables them to become resistant to various preventive treatments, including vaccines and antibodies. Honeysuckle (HS, Lonicera japonica), a well-known Chinese herb, has been used to effectively treat influenza infection for thousands of years. Several reports have shown that HS decoction can suppress the replication of influenza virus.” Pretty self-explanatory there! “The level of MIR2911 in mouse lungs after drinking HS decoction increased by > 8-fold, whereas no change in the MIR2911 level was observed in control mouse lungs (Figure 1H). As shown in Supplementary information, Figure S4, an ~10-fold increase in MIR2911 level was also detected in the liver, while the levels of MIR2911 in the mouse intestines and kidneys remained unchanged.” – This is the part that was truly amazing to me. It is just one small example that I can see the intelligence of our Lord within His creations! The fact that the honeysuckle RNA increased so drastically in 2 of the major organs that are infected by the flu virus shows massive intelligence. If it would have simply absorbed evenly throughout the entire body I wouldn’t have been so amazed but for it to absorb specifically in an organ like the lungs where the flu virus attacks the most, it’s just amazing! After all that and the longstanding traditional use of this herb for our immunity, along with the harms of drugs by medi-sin, I hope all will refuse the Pharma and harvest your own herbs for enhancing your immunity! Share the Truth and we will save and change lives together! Centers for Disease Control and Prevention: protecting the private good?